The most demanding offices can effortlessly produce a wider range of complex specialty documents with the Lexmark MS711dn, a robust laser printer that can easily be upgraded to handle more print jobs without sacrificing speed. Reliable performance and an easy-to-use interface makes this printer helpful in increasing productivity and reducing downtime. However, it is overpriced for something that can print only in monochrome. 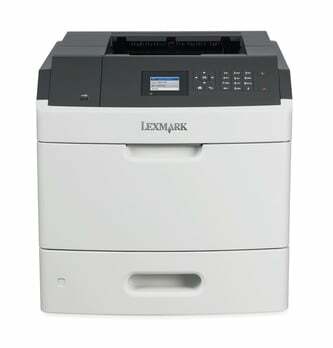 The Lexmark MS711dn has an understated design with a 16.5-inch tall, 20.1-inch deep, and 16.7-inch wide frame that weighs 23.8kg. It uses monochrome laser print technology with image quality that ranges from 600dpi to 2400dpi. It has 800MHz of processing speed as it runs on 512MB of RAM, both of which are contributors to the fast print speeds. It can handle 650 sheets by default, with an output capacity of 550 pages. Gigabit Ethernet, a USB host port, high-speed USB 2.0, and an internal card slot are the standard interfaces. There are finishing options. The powerful processor and upgradeable memory (up to 2560MB) can make the Lexmark MS711dn print in speeds of up to 55ppm. There is a built-in duplexer, which is fast, too. It is easy to hook the MS711dn into a network. Versatile media handling enables users to print on small and narrow label sheets and envelopes, as well as vinyl outdoor media. The paper capacity is upgradeable to 4,400 sheets with six additional input trays. The Lexmark MS711dn prints only in monochrome. It is rather heavy and looks outdated. Wi-Fi is optional. Some users also say that the Lexmark MS711dn is noisy.